A glance at the history that brought Polish National Catholicism to Plymouth, PA.
June 4, 1898 - Seed planted by Father Franciszek Hodur at a lecture at the Polish Youth Alliance auditorium attended by approximately 800 persons. July 6, 1898 - A charter was granted for the establishment of Saint Mary of Czestochowa Polish National Catholic Church in Plymouth, PA.
September 1898 - Rev. Waclaw Szumowski was appointed the first pastor of the newly organized parish. September 15, 1898 - A property was purchased at 269 East Main Street in Plymouth for the sum of $6,500.00. September 30, 1898 - An announcement in "STRAZ" indicated readiness for the new church construction. December 26, 1898 - Cornerstone of the new church was blessed by Father Hodur. March 1901 - Rev. F. Mirek assumed the pastorate; approximately 600 families were recorded on the parish rolls. June 23, 1910 - A major crisis developed resulting in the need to change the charter. The parish then became Saint Mary of Sufferance Polish National Catholic Church. April 1920 - The parish purchased a plot of land in West Nanticoke to be used as the cemetery. November 16, 1924 - The congregation commemorated the 25th anniversary of the parish. May 30, 1927 - A group of parishioners from the Plymouth parish organized a new parish in Edwardsville, PA.
April 19, 1929 - Rev. Stanislaw Szufladowicz became the 32nd pastor of the congregation, he served the parish until May 4, 1968. July 24, 1932 - A parish delegation met with Bishop Hodur; updated the charter, settled financial obligations and transferred the ownership title to the parish. October 3, 1932 - The charter was amended to Good Shepherd Polish National Catholic Church of Plymouth, PA.
October 2, 1938 - 40th anniversary of the parish was observed. August 6, 1950 - A plot of land adjoining the parish cemetery was purchased. November 15, 1959 - A new organ was blessed; the Fryderyk Chopin Choir had the patronage over the project. April 5, 1964 - The 65th anniversary of the parish was commemorated. July 7, 1968 - The first issue of the parish bulletin was published. October 12, 1969 - The Annual Convention of the United Maria Konopnicka Societies was hosted by the parish. November 11, 1974 - The principal observance of the 75th anniversary of the parish was commemorated. The church cornerstone was blessed in conjunction with the anniversary. November 19, 1978 - The 80th anniversary of the parish was observed. August 22, 1982 - A new rectory was blessed and dedicated. February 5, 1984 - Due to the excessive deterioration of the 86 year old church structure and the astronomical investment needed for renovations, it was decided that safety measures be taken to stabilize the building temporarily and the $46,065.23 improvement fund monies be transferred to a newly created "New Church Fund". A goal was set at $350,000.00 to build a new church in five years. February 2, 1986 - The New Church Building Fund reached $258,088.44 in pledges and contributions. August 2, 1987 - The semi-annual meeting took place; New Church Building Fund reached $261,214.59. The parish joined the Wyoming Valley Council of Churches. July 24, 1988 - The 90th anniversary of the parish was observed with a brief service and dinner. August 31, 1988 - Fr. Czeslaw Kuliczkowski was assigned to serve the needs of the congregation. A Cemetery Perpetual Care Fund was established. January 31, 1990 - The New Church Building Fund reached $461,465.40. 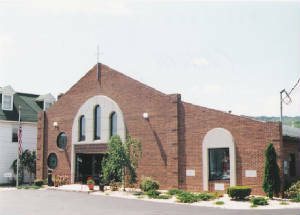 February 28, 1990 - Ash Wednesday's Liturgy was the last service at the hold church at 269 East Main Street. Resurrection of the Lord PNCC in Edwardsville became the temporary place of worship for the Church of the Good Shepherd community. April 16, 1990 - Demolition of the 92 year old church begins. June 17, 1990 - The Rt. Rev. Anthony M. Rysz, Bishop Ordinary of the Central Diocese, officiated at the groundbreaking ceremony for the new church complex. September 13, 1990 - The New Church Fund reached $580,000.00. July 28, 1991 - "Give thanks in all circumstances, for this is the will of God in Christ Jesus for you" Thess. 5:18... With such words Father Kuliczkowski announced the completion of the new church complex during the last 8:30am Holy Mass at the Resurrection of the Lord Parish, just a few hours before the official blessing and dedication. At 4:00pm, the Most Rev. John F. Swantek, Prime Bishop of the PNCC, the Rt. Rev. Anthony M. Rysz, Bishop Ordinary of the Central Diocese and Rev. Fr. Czeslaw Kuliczkowski were the principal celebrants at the blessing and dedication ceremony of the Good Shepherd church complex. Following the Liturgy of dedication, a parish dinner and program were held in the church auditorium. September 15, 1991 - School of Christian Living instructions began. November 25, 1991 - An outdoor bulletin board was erected at the entrance to the parking lot. February 15, 1992 - A delegation of parishioners traveled by bus to St. Stanislaus Cathedral in Scranton to participate in the historic service of Healing and Reconciliation. Edward Cardinal Cassidy joined the bishops of the Polish National Catholic Church and the Roman Catholic Church in the ongoing dialogue between the two churches. March 8, 1992 - A delegation from Good Shepherd participated in the Mass of Thanksgiving, dinner and program at St. Stanislaus Cathedral commemorating the 95th anniversary of the institution of the Polish National Catholic Church. October 18, 1998 - 100th anniversary of Good Shepherd parish commemorated. January 1, 1999 - The congregation observed the year as 'The Year of Older Persons' in accordance with the United Declaration spotlighting the needs of the world's rapidly increasing aging population. The year was also observed as 'The Year of the Bible' as proclaimed by The American Bible Society through weekly Bible studies. January 1, 2000 - The Rev. Dr. Czeslaw Kuliczkowski proclaimed the year of 2000 - 'A Year of Continued Education' - A number of Bible study sessions, audio-visual presentations and retreats were planned for the year. October 28, 2000 - Father Kuliczkowski presented a paper for the fifth time at the Annual History and Archives Conference in Scranton, PA.
January 19-20 2001 - An Epiphany Retreat for the Confirmation Students and their families was held at the Villa of Our Lady Retreat House in Mount Pocono, PA.
July 4, 2001 - A Delegation of parishioners attended the 25th anniversary of the dedication of the Spojnia Home for the Aged in Waymart, PA.
July 29, 2001 - 10th Anniversary of the observance of the New Church Complex dedication was held. Alvin Celmer served as chairperson, Rev. Dr. Kuliczkowski was the honorary chairperson. Dinner, Christian fellowship and program were arranged by the Adoration Society of The Most Blessed Sacrament. December 2, 2001 - On the First Sunday of Advent, a 'Prayer Chain' ministry was initiated by the Ladies' Adoration Society of the Most Blessed Sacrament. July 4, 2002 - The congregation participated in the national campaign to issue a commemorative stamp to honor Lt. Colonel Matthew (Urbanowicz) Urban for being the most decorated World War II combat soldier, along with Audie Murphy. January 11, 2003 - Father Kuliczkowski observed the 25th anniversary of ordination to the holy priesthood with 10a.m. Holy Mass of Thanksgiving. January 26, 2003 - The Annual Parish Meeting assembly addressed the topic of the SWOT (Strengths, Weaknesses, Opportunities, and Threats) strategy in an effort to evaluate the congregation's profile with regard to Outreach, Mission, Evangelization and Marketing. August 31, 2003 - 25th Anniversary Dinner and Program acknowledged Father Kuliczkowski's priesthood and his pastoral ministry at the Church of the Good Shepherd in Plymouth and Resurrection of the Lord in Edwardsville, PA.
December 11, 2003 - Mr. Samuel Bosch of Temple B'nai B'rith in Kingston, PA. was the guest speaker at the Advent Bible Forum. July 4, 2004 - Fr. Kuliczkowski was announced as the winner of the new logo design for the 'Manor at Waymart'. August 27-28 2004 - The congregation took an active part in the First Annual Kielbasa Festival sponsored by the Borough of Plymouth. October 7-9, 2004 - Mrs. Alice Parulski and Fr. Kuliczkowski represented the parish at the IX Central Diocesan Synod held in Bethlehem, PA.
November 11, 2004 - The congregation initiated its 10th annual Veteran's Outreach program for the old, sick and disabled veterans at the local VA nursing home and hospital. December 31, 2004 - The 5th Annual Saint Sylvester's celebration and New Year's fellowship was sponsored by the Ladies' Adoration Society of the Most Blessed Sacrament. January 1, 2005 - The parish begins the official Clergy Pension Capital Fund Campaign. Bernadette Truszkowski was named parish representative for this PNCC-wide campaign. March 19, 2005 - A 'Swieconka' (Easter breakfast) workshop was sponsored for the student body of the School of Christian Living and the Christina Education Department activists. August 21, 2005 - Children, youth and the Youth Ministry coordinators participated in the Annual Children and Youth Day sponsored by District 8 of the Polish National Union of America at Knoebel's Park in Elysburg, PA.
August 28, 2005 - Polish National Catholic Church Youth Sunday was observed with children and young people serving as greeters, ushers, lectors, singers, acolytes and collectors. September 4, 2005 - The congregation initiated a drive for assisting the hurricane-ravaged Gulf Coast states. The "Katrina" drive benefited the U.S. Red Cross as well as PNCC-led appeals. November 5, 2005 - Mrs. Diane Supey and Fr. Kuliczkowski represented the congregation at the Central Diocesan School of Christian Living Seminar held in Scranton, PA.
May 6, 2006 - Mrs. Alice Parulski and Fr. Kuliczkowski represented Church of the Good Shepherd Adoration Society of the Most Blessed Sacrament at the Central Diocesan Convention held in Frackville, PA.
May 14, 2006 - 'Focus on the Family' monthly inserts added a 'family' dimension to the weekly edition of the parish bulletin and it continued until the Solemnity of the Christian Family - October 8, 2006. July 30 - August 10, 2006 - Father Kuliczkowski coordinated his 5th Tour to Poland sponsored by the Education and Youth Commission. The $9,000.00 profit benefited the Polish National Union Scholarship Program. September 3, 2006 - The Most Rev. Robert Nemkovich confirmed the students of the 2005-2006 confirmation class. December 10, 2006 - District 8 of the Polish National Union of America Christmas Eve dinner and program were held. February 16, 2007 - the 54th anniversary of the death of Prime Bishop Francis Hodur was commemorated with a Memorial Mass and the launching of a parish website: http://goodshepherdpncc.tripod.com. Cleric Adam Egan became the webmaster. March 11, 2007 - 100th Anniversary of the Polish National Catholic Church was observed. New pew books donated in honor of sp. Prime Bishop Franciszek Hodur were used for the first time. January 11, 2009 - Fr. Czeslaw Kuliczkowski celebrates his last mass as Pastor of The Good Shepherd Church Of Plymouth. January 18, 2009 - Fr. Pawel Filip celebrates his first Sunday mass as the new parish administrator of The Good Shepherd Church Of Plymouth. May 11, 2014 - Fr. Lucian Urbaniak celebrates his first Sunday mass as the new parish administrator of the Good Shepherd Church of Plymouth.